I loved visiting Vancouver Island and in particular Tofino like we did a few years ago. The area has an amazing culinary culture on to its own. This part of Canada is a must see and the beautiful Wickannish Inn looks perfectly spectacular. 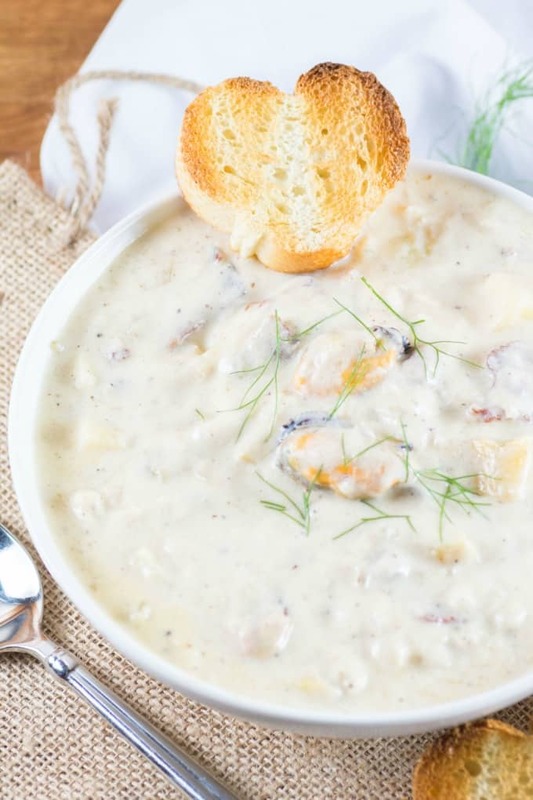 I was thrilled to review The Wickannish Cookbook and we dove head on making this out of the world West Coast Seafood Chowder. The views, the vibe, the food scene engulf the visitor to this area. The Wickannish Inn is located on the beautiful windswept Chesterman Beach in Tofino which literally is the most farthest west you can go in Canada. The “Wick” as they call it has been around for 20 years. 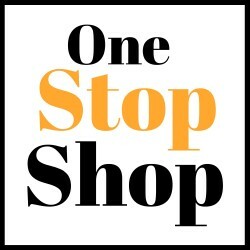 They have stayed true to their initial vision of serving fresh, seasonal, local produce. With this The Pointe Restaurant has been a draw for people far and wide. 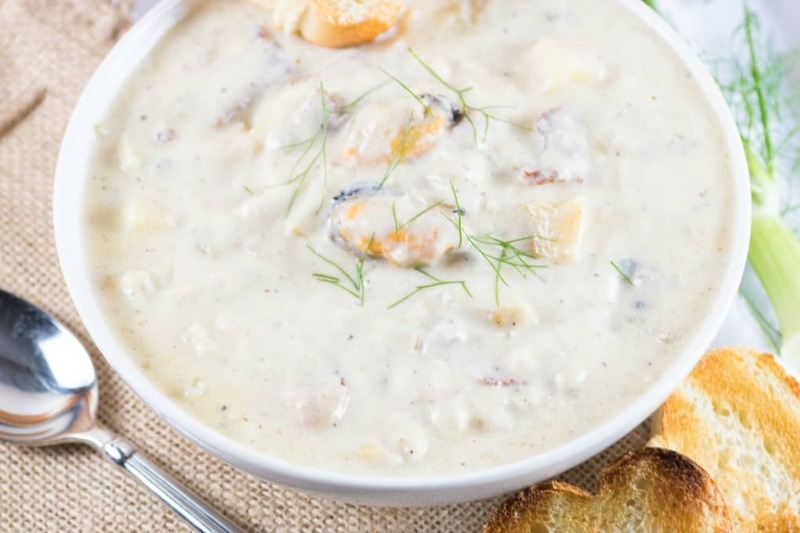 We wanted to try something really spectacular from this cookbook and you must agree we hit it with this stunning West Coast Seafood Chowder. The perfect medley of fresh seafood, potatoes, fennel, celery, onions, bacon, cream and more. This lovely soup can be eaten at anytime of the year and I love a chowder just as much in the summer as I do in the winter. This stunning cookbook is a substantial hard cover filled with sublime photography that transcend you to this stunning little spot on the west coast. Tofino is a food lover’s destination as they say and this book will have you paging through it wanting to hop on the next flight! After a wander through Tofino and the “Wick” the cookbook takes you from breakfast and brunch to soups and breads, salads and grills, casual fare, seafood, meat, poultry, vegetables and of course dessert. Recipes such as Blueberry Sour Cream Muffins, Naan-Style Bread, Sockeye Salmon “BLT”, Mussels and Clams (have to make this one soon) are just the start. Also offered are Dungeness Crab and Mascarpone Ravioli, Truffled Cauliflower “Risotto”and Gluten Free Salted Caramel and Chocolate Tart just to name a few! 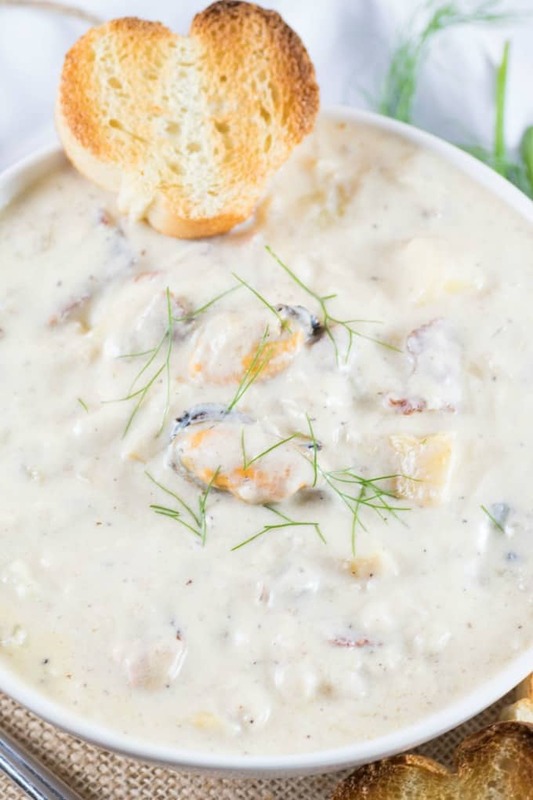 This chowder is rich and creamy and full of wonderful seafood flavor with the extra goodness of smoky crisp bacon to enhance all that is in there. A gorgeously crispy baguette is all you need to accompany this bowl of chowder. Close your eyes and get swept to Tofino to enjoy this meal. A few little fennel fronds is all I did to garnish this meal. It is hearty as a meal on its own or as a smaller serving with a salad or sandwich. 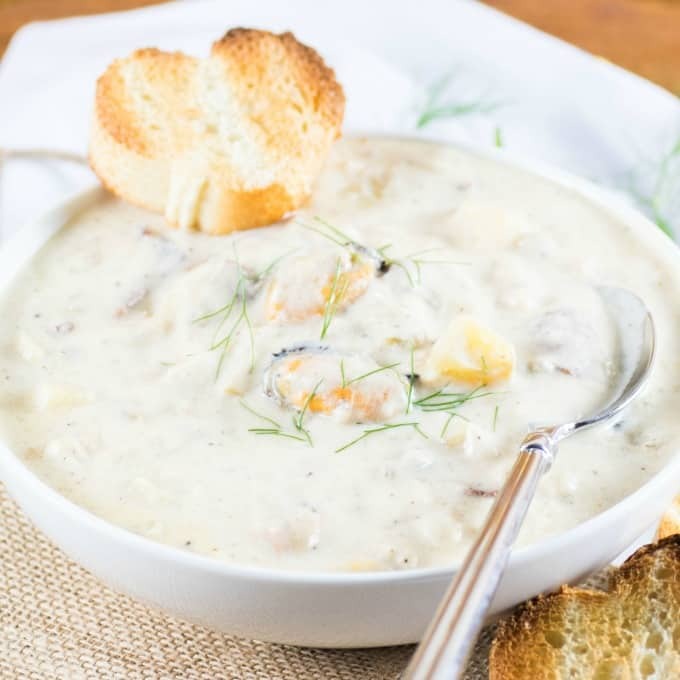 Rich, creamy, and loaded with local seafood, Chef Labossiere’s classic west coast seafood chowder is the perfect meal for a cold and stormy night, especially if you serve it with rustic bread and a pint of beer. Expect your guests to demand seconds. In a large pot with a lid, bring the stock to a boil. Add the mussels, cover, and steam until the shells open, 4 to 5 minutes. Remove the mussels from the liquid and allow to cool slightly. Discard any mussels that have not opened. Strain the liquid, cover, and refrigerate until ready to use. Remove the mussel meat from the shells, cover, and refrigerate until ready to use. If you like, you can set aside a few in the shell for garnish. Rinse out and dry the pot and return it to the stove. Add the bacon and cook over medium heat until crisp. Remove the bacon, leaving the fat in the pot, and dry on a paper towel. Add the butter to the bacon fat and heat until foamy. Add the diced onions, fennel, and celery; cook until soft and translucent, 8 to 10 minutes, stirring occasionally. Season with sea salt. Meanwhile, in a medium-size saucepan, place the milk and cream and cook over medium heat, but do not allow to boil. Stir the flour into the vegetables and cook, stirring, until thickened— this will create a liaison and prevent the chunky bits of vegetable and seafood from sinking to the bottom of your bowl later. Pour the hot milk mixture slowly into the vegetables, stirring constantly until well blended and smooth. Bring back to a simmer, stirring frequently. Stir in the potatoes, bacon, and reserved cooking liquid from the mussels. Return to a simmer and cook until the potatoes are tender, 15 to 20 minutes. Add the cooked mussels, chopped oyster meat, and cubed fish and cook for 4 to 5 minutes, stirring occasionally. Season with salt and pepper and, if you like, a few dashes of hot sauce and/or Worcestershire sauce. 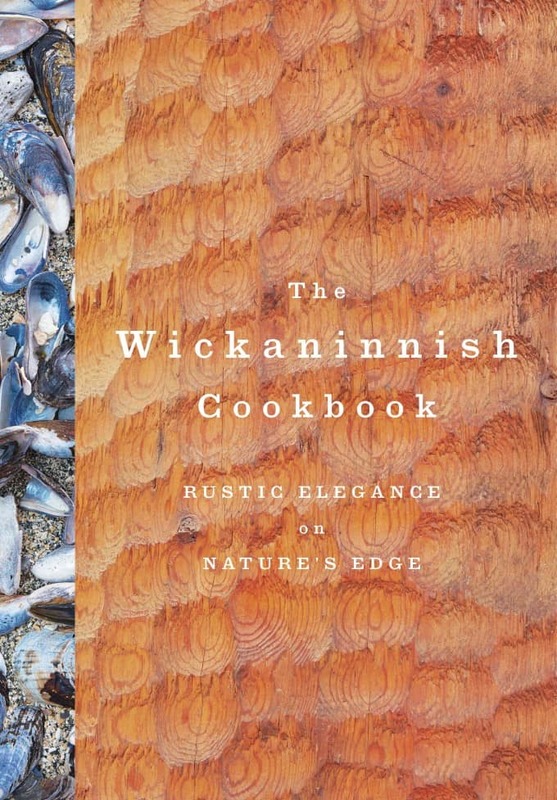 Excerpted from The Wickaninnish Cookbook: Rustic Elegance on Nature’s Edge by The Wickaninnish Inn. Copyright © 2018 Wickaninnish Inn. Published by Appetite by Random House®, a division of Penguin Random House Canada Limited. Reproduced by arrangement with the Publisher. All rights reserved. Oh wow! This sounds like something we would love! I am sharing with my husband! Wow, this chowder looks so good!! 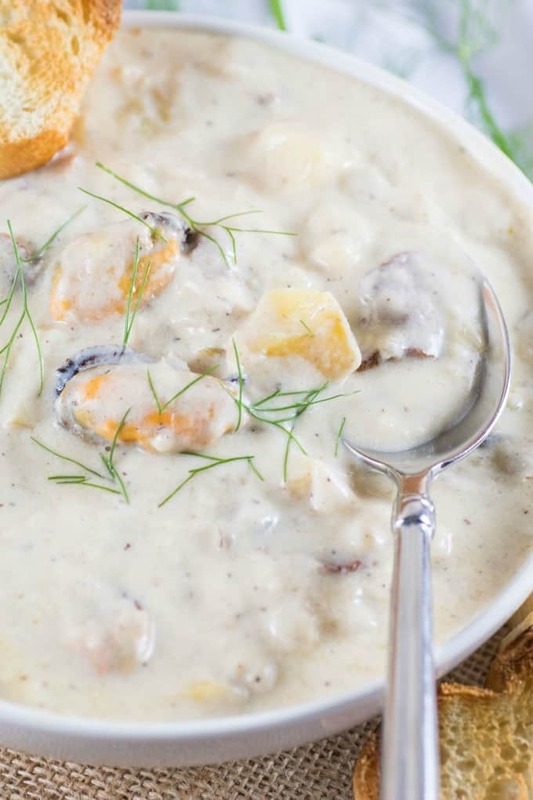 I love New England clam chowder and would love to try this rendition!! Seafood chowder is one of my favorites – I love adding extra cheese and hot sauce! I love chowder and seafood, why not put it together! This looks so good I can’t wait to make it. We live smack dab in the middle of the midwest so some seafood isn’t that easy to come by without spending a kajillion dollars. My husband will love this though so I will keep an eye out for sales. It looks so creamy! Perfect dinner any night of the week! You definitely hear a lot about the east coast chowders but this looks delicious. I really want to try it!